Diwali is a Hindu holiday celebrated every fall. 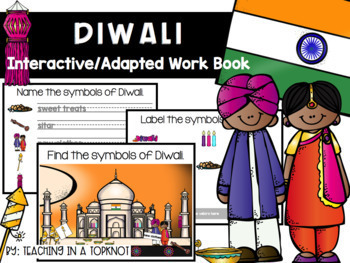 This book is great practice of basic skills while learning Diwali vocabulary. This book provided functional themed activities and is differentiated to meet the needs of a variety of learners. In addition to being an adapted work book, this resource makes a great BUSY BOOK for restaurants, car rides and waiting rooms. This is a perfect book for Holidays Around the World units. 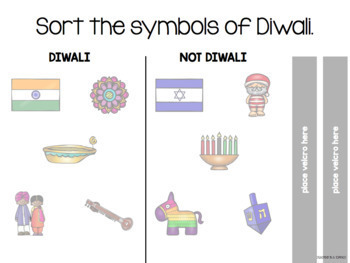 “Match” pages for symbols of Diwali. 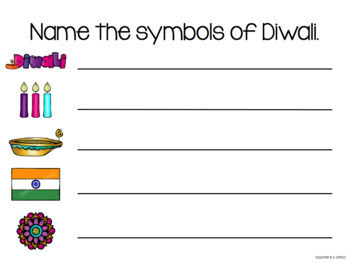 “Label” pages for symbols of Diwali. 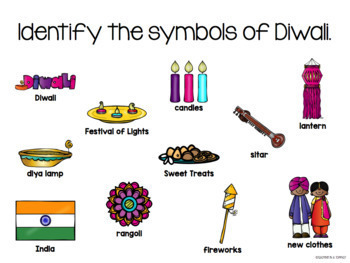 “Know” page for symbols of Diwali. “Find” page depicts the Festival of Lights. How do I put this work book together? Pick the pages that fit your students’ needs. Laminate all of the pages you have chosen. Spiral bind the pages or put them in a 3-ring binder. Add soft velcro to the laminated pages. Cut apart the laminated matching, labeling and sorting pieces. Add hard velcro to the back. DOWNLOAD THE PREVIEW TO READ THE COMPLETE "HOW TO ASSEMBLE & USE" AND "WHAT'S INCLUDED" PAGES. Be the first to know about my new discounts, freebies and product launches. Look for the green star next to my store logo and click it to become a follower. Or just click HERE.